Forgot to add the pictures to my Spring Break Sleepover with the girls. We had breakfast and went to the park. 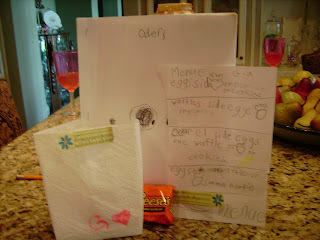 (Earlier Post) These are pics of the girls fixing breakfast and the menu and place settings. We also said the "Pledge of Allegience" at breakfast. 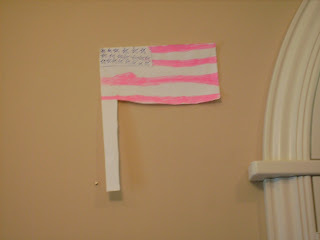 Malaya or Mallory made the flag and taped it up on the wall so we could say it before breakfast. So funny! We said it with great conviction! 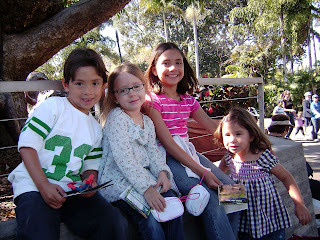 I forgot that I went to the San Diego Zoo with 4 of the grandkids the first week of spring break. What can I say, it was 2 weeks ago. 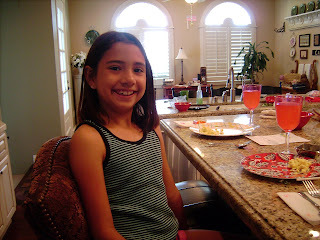 But I downloaded pictures from the camera and there they were to remind me of the fun time we had. We left on Monday morning and headed directly to the beach, where I sat ensconsed in blanket, sweater, jacket, and shoes and socks. The kids all had swimming suits on. We buried them in the sand. They chased the birds and built sand castles. When their lips were blue we packed them up and headed over to the rollercoaster at Bellmont Park. 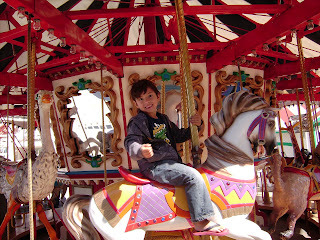 We rode the Merry Go Round and a couple of other rides, the headed to the hotel. There they immediately sought out the pool and continued to cool their body temps to just above freezing. I stayed under 2 huge towels and shivered most of the time. It was even too cold to get in the hot tub. After everyone had showers and warmed up Zulema and I couldn't bring ourselves to load them all up for dinner. So we ordered room service. Grandpa is still trying to float a loan to pay for that but oh it was so worth it. Jade,Dawson, Brooke, and Naomi all thought it was the best! After watching Beverly Hills Chihauha and some other movie I don't recall, we decided to get them to bed. Since we had 6 of us, Zulema had brought her blowup mattress. But it was in the car which we had Valet parked. so she went down, got them to bring the car around, and she lugged this thing up to the room. It had to weigh 50 pounds I swear. Then she unfolded it to blow up with the electric pump. The pump that Jason forgot to put back into the bag when they used it last. So the kids slept on the floor and didn't seem to be any worse for it. Early, well not that early, we got up and headed to the zoo, via MCDonalds. 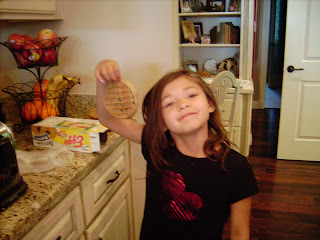 OH YEAH, TOYS Pancakes all around! Then off we went. Had a fun bus ride, saw all the snakes, oooh, and went to the petting pens. Most of the animals were resting from being petted so that was a little dissapointing. 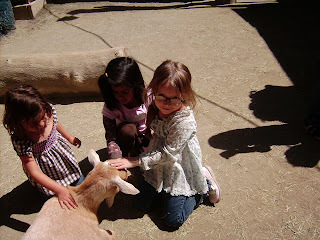 But still, you don't get to pet a goat that often in the city!! Then we rode the tram, saw the polar bears and rode back in time to catch the sea lion show. I enjoyed it but the kids thought it was too short. Hey, this is the zoo, not Sea World! By now it is mid afternoon. The kids are tired and whiny so they want to leave. We did have lunch at one point and snacks a couple of times but they were pretty much done. As we headed out the gate I remembered that last time I was at the zoo I had missed the gorillas so I determined that we had to see them this time. So we all hiked down the long hill, glimpsed them from behind a wall of people before they fled to the other side of their enclosure and hiked back up the hill,which by now was twice as long. Naomi had a little accident and we had no extra clothes so used Dawson's sweatshirt to wrap around her waist. This did not please Dawson at all and he walked the entire way to the parking lot, giving us dirty looks over his shoulder and clenching and unclenching his fists. His mom told him he had better stop being so mad by the time we got to the car or she was going to leave him. You could see him trying to get over it but when we got to the car he had reached meltdown stage and cried long and hard. Not because Naomi was wearing his shirt but because we didn't go to Tiger River to see the tigers. I had no idea Tiger River was that important or we surely would have made the effort to hike one more enormous hill! After about 20 minutes all was calm and we had a fun ride home. 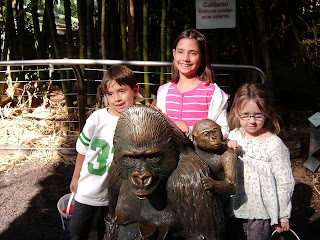 That was our Spring Break Trip To The Zoo and we all have fond memories and pictures, too. I don't know where the last few weeks have gone. I feel like I am in a wave of endless days, flowing and ebbing with such swiftness, that I am continually tredding with out getting out of the water. Conference was wonderful. I wish I could recall every quote that touched my heart. I wish I could recall one even! I guess I feel lucky I can recall watching it at all. I am grateful that they come written so we can feast over and over. Spring break was a delight even if I don't go to school. I had lots of fun with all of the kiddies! We went to the fair and all came home with the most delightful hats! Of course, I didn't have the camera! I want to get a picture and when I do I will post it. One night, the 3 middle girls spent the night. I got up at 3am to find them giggling in the kitchen. What are you guys doing? Just stuff. ok well, keep it down and go to bed pretty soon. Ok grammy! The next morning I came out to find the table all set with decorated napkins, name tags, and a menu. They were so excited! 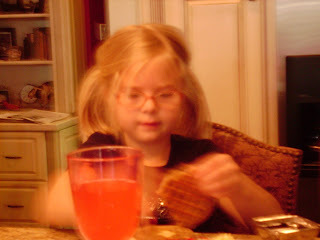 They made eggs, waffles, juice. In the middle of the night, the peeled I don't know how many tangelos and cut up all the strawberries and mixed them with cinnamon! YUM! We had a very festive breakfast, after which we went to the park and played. I did have the camera this time. Oh, I love those little girls!!! I am so blessed to have all of my perfect grandchildren right here! How I love being grandma! They are so good to me!